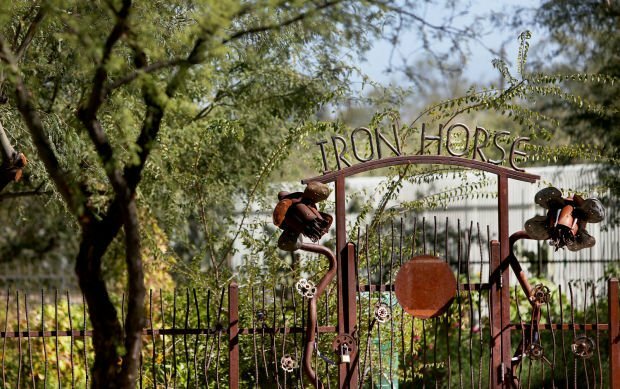 Nestled in the pocket that connects downtown, North Fourth Avenue and the University of Arizona, Iron Horse is one of Tucson’s oldest and smallest neighborhoods. It is packed with history, innovation, quirkiness and a juxtaposition of new and longtime residents who make the area pop with personality. Master of Americana Charles Phoenix﻿ has hung out with mermaids in Great Falls, Montana, attended a pumpkin party in Circleville, Ohio, and strolled down Fremont Street in Las Vegas for its 100th anniversary. 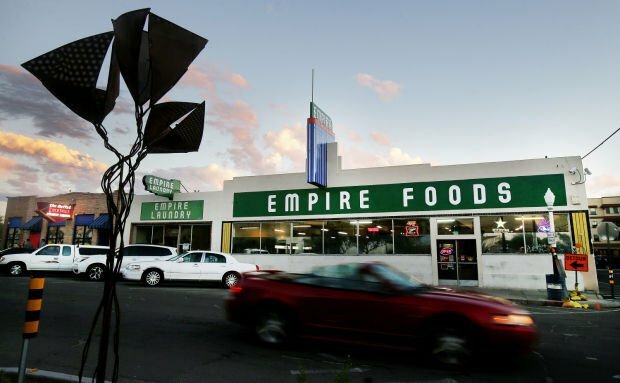 But one of his favorite places in the country is in the Iron Horse neighborhood: New Empire Food Market, which has sat, almost unchanged, at 526 E. Ninth St. since the 1930s. Tun Lim Lee, 85, and his wife, Anne Lee, 74, have run the family-owned market for more than 50 years. They’ve quietly been a staple in the historic district, providing groceries as the clientele has changed from low-income families to hippies to the student and young family community it is today. Little has changed at New Empire Food Market. The two Chinese natives took over the market and the space next door — now Empire Laundry — in 1959. They haven’t tired of the business: While their five children, all native Tucsonans, are eager to help out with the store, the elder Lees still dedicate themselves to the market’s daily operations. “It keeps them going,” adds Calvin Lee, 52. Alvin, Calvin and the other three Lee children — Tina Champlin, 53, Melvin Lee, 46, who runs Empire Laundry, and Stacey Lee, 44, grew up working in the market — and almost living in it: until 1976, the Lee home was an attached building. While the siblings have gone on to other careers, they all return to help at the market when they are able to. The Lee children say it’s been hard getting their parents to change things about the store. But slowly, unobtrusively, progress has crept in. A new beverage and coffee center in the store gives students the option of fresh coffee as they walk to school. And the iconic neon signs for the market and laundry are being renovated. The sign update, which will be based on historic photos of the original, is a piece of the past getting a refresher from a piece of the present: The neon signs are thank-you gifts from the owners of the Junction at Iron Horse, a new student-housing complex next door. The small neighborhood is adjacent to the tracks of the Southern Pacific railroad. Residents in the early 1900s had to live within earshot of the train whistles so they knew when to go to work. The train still goes right through the neighborhood, blasting its horn every few hours. But the people who now live in the roughly 500 residences in Iron Horse have gotten used to it. Her family lives in a home that is typical of the neighborhood — craftsman-style, brick houses that can date to the late 1800s. Mitnik-White’s husband, Mik White, is president of the association — a position he took to help with negotiations between the Junction at Iron Horse and the neighborhood. He points to those negotiations as evidence of the neighborhood’s sense of community. At first, discussions were so contentious that everyone walked out of a meeting at Councilman Steve Kozachik’s office. By the end, the Junction agreed to a list of 31 points, which included eliminating one floor from the plans, along with adding no-crime and nondiscrimination clauses. The list also specified the redo of the signs, which was Kozachik’s idea. The neighborhood has been a perfect fit for the Whites and their 8-year-old son, Eli, who they say has become street-savvy. He walks everywhere, and his family’s propensity to “shop local” has even made him a neighborhood celebrity of sorts. The neighborhood’s walk score — at 86, one of the highest in Tucson — has also brought millennials to the area. Native Tucsonan Daniel Dempsey, ﻿31, moved into the neighborhood in March 2013 after living five years in Manhattan. He attended New York University and Columbia, and worked on Wall Street before returning to Tucson to launch an online business. He picked the Iron Horse neighborhood because its active and friendly nature reminded him of New York City. While the neighborhood is old — Dempsey’s home was built in 1894 — it attracts a young population. Alene Fletcher was at Pima Federal Credit Union when she noticed a wall-size panoramic photograph of Tucson. As she examined the picture, she noticed a train caboose resting in the shadows of the Coronado Hotel on Ninth Street. Fletcher, a retired teacher who taught in the Sunnyside School District for 20 years, is the proud owner of Southern Pacific Caboose No. 1233, a bright-red, 25-ton piece of American railroad history. It sits in the backyard of the duplex she owns on Hoff Street. Its rear is directed at the tracks on which the modern train runs every day. She bought the refurbished caboose on eBay for $18,000 in 2004. Her partner, Dan Yokota, helped with the logistics. She made a donation of $5,000 to Old Pueblo Trolley, and the nonprofit organization installed a roadbed and track for the caboose to sit on. The track is from Tucson’s old trolley system, Fletcher says. While the exterior shows its age, the inside is sleek. Custom-designed glass windows accompany the hardwood floors. Chandeliers hang from the ceiling to illuminate the game and dinner tables. The kitchen is dominated by an Old English bar area that sits directly across from a stove, refrigerator and sink. And it has working water, power and air conditioning. Fletcher and Yokota typically use the caboose for dinner parties. “I would love for other people to use it, but I haven’t been able to break into that market,” Fletcher says. When Marilyn Smith purchased The Buffet Bar & Crock Pot with her daughter in 2008, she knew nothing about the area. Smith was urged by the previous owner to get involved with the community, and was pleasantly surprised by the neighborhood’s enthusiasm. While she doesn’t live in Iron Horse, she is the vice president of the neighborhood association. The Buffet, which will celebrate its 80th birthday Saturday, is an icon, and also one of the oldest bars in Tucson. Smith, 72, her daughter, Lisha Smith-Davidson, and daughter’s husband, Bill Davidson, are the 16th owners of the bar at 538 E. Ninth St. Two years ago, Esquire magazine crowned it one of the 12 best dive bars in America. The Buffet reflects the Iron Horse neighborhood, which is a conglomerate of people from every sector of life, Smith says. It starts with the neon sign, which has a train running along the side of it. The walls of the bar are covered with the signatures of customers, scribbled with a bold, black sharpie. On the east side of the J-shaped bar, there’s a view of the pool table. A mounted moose head sporting sunglasses presides over the billiards players. For years, the only beer they served on tap was Coors Light. Whether it’s 6 a.m. on a Monday or 10 p.m. on a Friday, “The Buff” is always packed, say people who frequent the bar. “We have a whole variety of people who come in here,” Smith says. “You may sit down and have a judge on one side and a toothless homeless person on the other side, but everybody gets along. Justin Sayers is a University of Arizona journalism student apprenticing at the Star. Where: 538 E. Ninth St.
Information: Portion of proceeds will benefit Fluxx Studio and Gallery, an LGBTQ art gallery located down the street, 414 E. Ninth St., and Positively Beautiful, an HIV and AIDS awareness nonprofit. Mayor Jonathan Rothschild might be there to flip a commemorative switch to celebrate the bar's new neon sign. Peggy Barcley, a long-time and favorite fixture at the Buffet, died last Sunday. She was 83. Affectionally known as Miss Peggy, Barcley had tended bar at the Buffet for 35 years, retiring in 2012. But retirement didn’t keep her away — she frequently stopped in to greet old customers and fellow employees, people she saw as friends. The Buffet plans to celebrate that friendship and Miss Peggy’s life from 1-4 p.m. on Nov. 9. Bring stories and a potluck dish to share.